Recently we had to build a mobile application and one of the requirements was to implement a corporate authentication for managing the user accounts. We think the approach that we used could be interesting and helpful in similar scenarios that is why we would like the share our experience. Ionic – We used the Ionic framework to build the mobile app itself. Ionic is a great framework for building hybrid mobile apps. It is based on AngularJS and provides handful components and tools. The apps build with Ionic are easily distributed to iOS and Android devices. ASP.NET Web API – We used the ASP.NET Web API 2.2 to build the server part. It pulls the data from the database and sends it to the mobile app in JSON format by implementing a RESTFul API. It also handles the authentication part by implementing part of the OAuth 2.0 protocol. Okta – Okta is a third-party authentication provider and our client had already been using it for managing their Active Directory accounts. 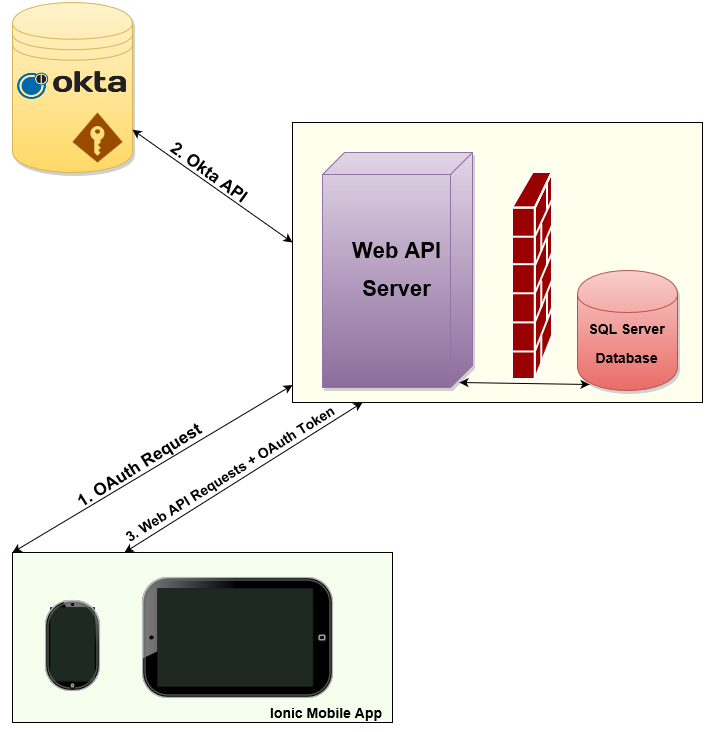 In short, the mobile app sends the credentials to the API server which is responsible to validate them by communicating with Okta. Once the credentials are validated then it generates a token which is stored on the mobile device and used for further communication between the mobile app and the API server. The client mobile app is built with Ionic which is based on AngularJS. So, we have built a couple of AngularJS services that are responsible for handling the authentication on the client side. We use the Web API infrastructure at the server side. It is OWIN based and we use the OAuth 2.0 related classes for OWIN to build our specific authentication functionality. For more information you could check the Microsoft.Owin.Security.OAuth package. If the user is not authenticated then show the Login form. Otherwise, try to load some of the corporate app data. On the Login form the user enters his credentials and then an Access Token Request is sent to the server. The server validates the user credentials by checking them against the Okta identity provider. If the credentials are valid the server generates an access token (expires after 30 minutes) and a refresh token (doesn’t expire in practice). The refresh token is stored into the database together with some encrypted info about the user. The client app receives the tokens and it stores them locally in the device. With each data request to the server, the client app is sending the access token. If the access token is still valid (less than 30 minutes have passed) then the server will return the data. If the access token has expired the server will return error 401 (unauthorized). In that case the client app will send the refresh token to the server. The server tries to validate the refresh token by searching it into the database. If the refresh token is found then it tries to check the user credentials info against Okta. This is done to catch any deactivated users, for example. If everything is valid then a new access token is generated and sent back to the client. Otherwise the user is redirected to the Login form. a) Access token – It is used with each request to authenticate the client on the server. b) Refresh token – It is used when the access token expires. In that case the refresh token is used to extend the login session and generate a new access token. As noticed, we have configured the access token to expire every 30 minutes. The refresh token is configured to expire after a very long time (almost infinitely). As a result, when the user logs into the app on the mobile device then he remains logged in until he manually logs out or his corporate account gets deactivated, for example. The SimpleAuthorizationServerProvider class is used to handle the access token generation and validation and the SimpleRefreshTokenProvider class is used to handle the refresh token generation and validation. More details about those providers are shown below. If the Client Id is invalid then an error is sent, otherwise the context is validated successfully. The refresh token is actually a GUID. When a new refresh token is generated we generate a new GUID and then we store the refresh token into the database. In addition to the token itself, we store information about the client credentials in an encrypted way. This information is used later to validate the user credentials against the Okta API each time when the refresh token is validated. ReceiveAsync() – this method is called when validating the refresh token. The refresh token is pulled from the database by the token provided in the request. If the refresh token is found then the user credentials are validated against the Okta service. If everything is valid then the ticket is deserialized which is loading the ticket into the context and the request is processed successfully. The client app is sending the access token by utilizing the Authorization HTTP header. The service is checking the error code when a particular request to the server fails. If the error code is 401 (unauthorized) then it is sending a refresh token request. If the refresh token request is successful then the code is trying to resend the original request, otherwise the user is redirected to the login form. In our scenario the user credentials are validated against the third-party identity provider Okta. However, similar functionality could be used to authenticate the users when using another identity provider like Azure Active Directory, for example. Of course, the same idea is valid even for the simpler scenario when the users are stored into the local database on the server. That covers the process of implementing tokens based authentication for a hybrid mobile application. Thank you for reading it!